First of all welcome and thanks for taking a moment to visit our site. Our aim is to offer you all the information you might need on large format digital printing, screen printing and graphic installation. Our site has information on over 50+ large format digital print materials and all of the services that we offer. With over 30 years of print industry experience we have a lot of knowledge that we can share, we hope that this site offers a glimpse into our expertise but if you need to ask a question do not hesitate to get in touch. We pride ourselves on our customer service driven approach, we love to chat about print and help our clients with innovative ideas and identifying better methods of print production. Feel free to pick up the phone or even pop in for coffee and a tour round. 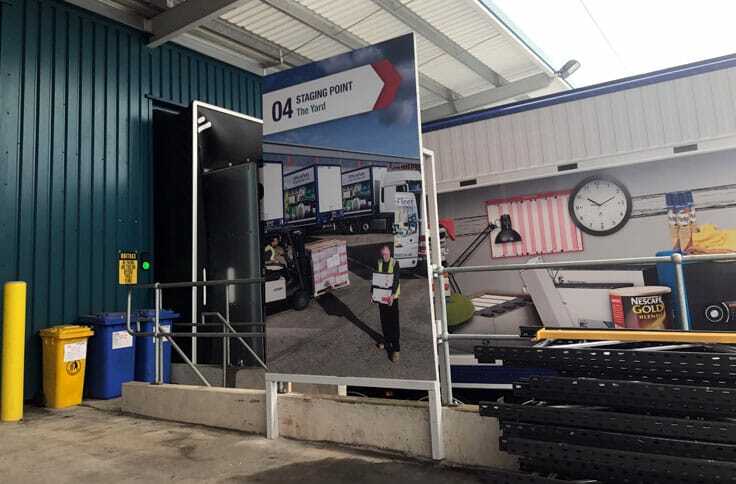 As well as our in-house large format printing we also have a full array of print finishing which means we are able to offer exceptional lead times as we have complete control of our production schedule. Our in-house print finishing includes CAD cutting, laminating, plotter cutting, guillotining, varnishing, hemming and eyeletting. Our diversity allows us to offer solutions to even the most complex and bespoke print requests. Our print production facility based in Kent, under an hour from London is operational 24/7 which allows us to service the whole of the UK and work on large national campaigns. Our clients include some of the UK’s leading print management companies, design agencies, marketing teams, Government bodies, blue chips and major retailers. Our ethos is offering a service driven approach to managing our clients needs, always aiming to consult and provide the best solutions for any print project. We are not a faceless online ordering print service. We passionately believe that conversation results in the most cost effective solutions that deliver on individual requirements. Founded back in 1986 by the late Mervyn Wallace and now employing over 30 members of staff. 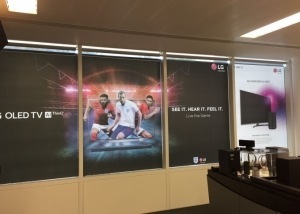 Wallace Print is a leading large format digital and screen printer offering a 24/7 print service to retail, design and marketing agencies, print management, trade printers and a wide range of public authorities. Our diverse in-house set up of digital print and screen print, alongside a multitude of finishing capabilities including lamination, cad cutting, plotters and hand fulfilment makes us one of the UK’s true one stop large format printers. Our 30 year history within the print industry contains many milestones since our humble beginning in the back of Mervyns shed with a handbench and a dream. We work with some of the UK’s biggest print management companies, design agencies, marketing teams and other printers. We understand trade pricing and even more importantly we understand client confidentiality and plain packaging. 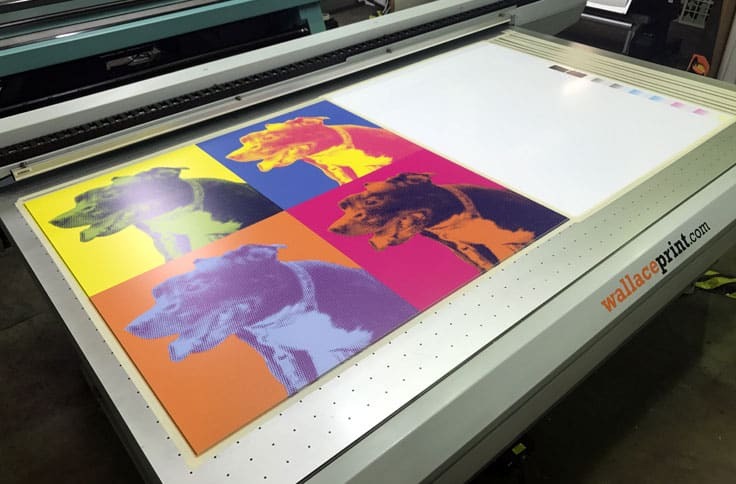 Please contact us if you have a requirement for large format digital printing or screen printing on an ongoing basis. If you are looking for a reliable trade print partner in the UK we have a range of case studies, testimonials and over 800+ photos showing some previous work from our 30 years of trading. 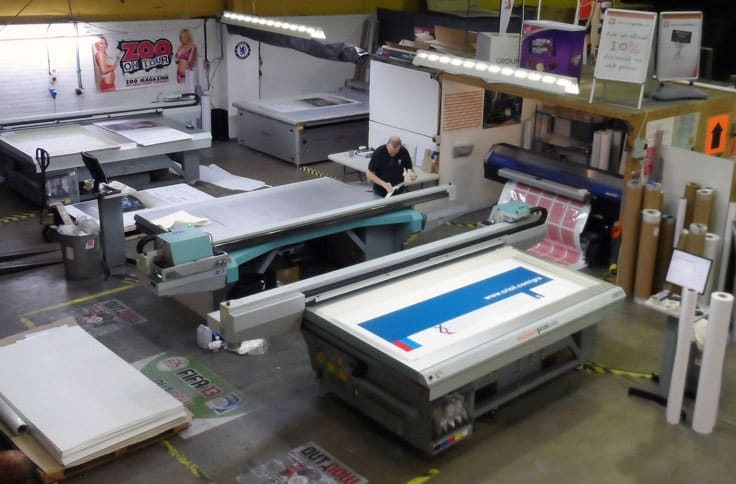 Over 30 years’ experience in digital and screen print, we are one of the UK’s original large format printers. Trusted nationally by the biggest brands to look after and deliver bespoke solutions across a wide spectrum of print services. Our customers include multiple forms of retailer from independent to chains, blue chip organisations, luxury brands, design and marketing agencies and other print and print management companies. We work on a national scale and are often able to provide a next day service for large format digital print, due to our 24/7 print facility. Our main production is based in Kent on the fringe of London, making us an agile print partner to those in the capital. 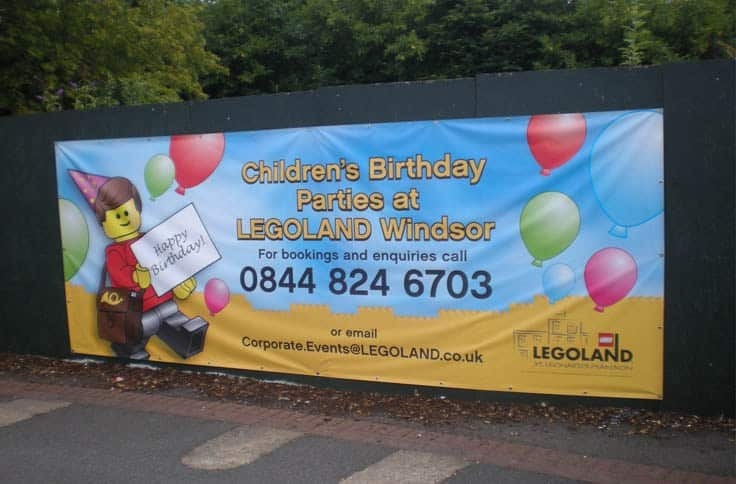 We print large format banners, banner printing up to 5m wide on mesh banner PVC, 440gsm banner PVC and double sided banner PVC. Exhibition print including exhibition stands, exhibition roller banner stands with brands such as Grasshopper roller banners, Orient roller banners, Barracuda roller banners, Greenwich roller banners and Mosquito roller stands. We also specialise in printed exhibition pop up display stands such as the 3×3 3×4 3×5 Impact pop up stands, self build exhibition stand ideas including Vortex banner stands, exhibition shell scheme wall drops, wedge display stands and pegasus banner stands. 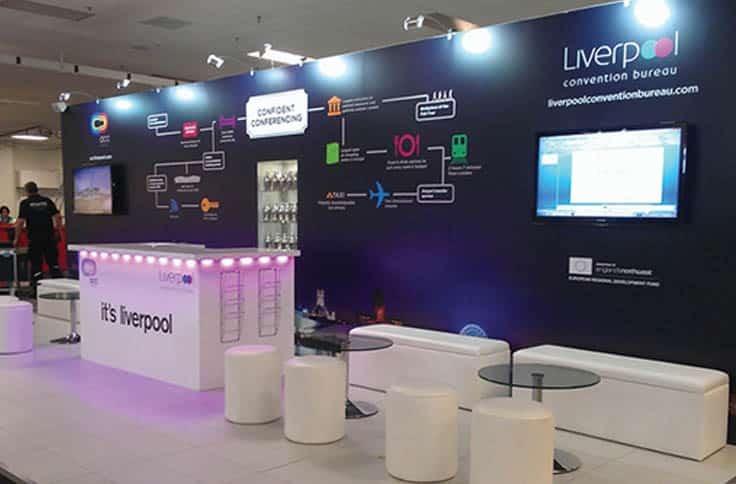 Exhibition systems we print graphics for include T3 exhibitions, Curvorama exhibition stands and the full Ultima range & Innotech range of exhibition hardware. 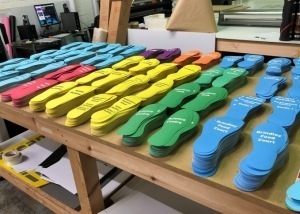 Printed point of sale including wobblers, shelf strip printing, twist lock printing, poster printing. 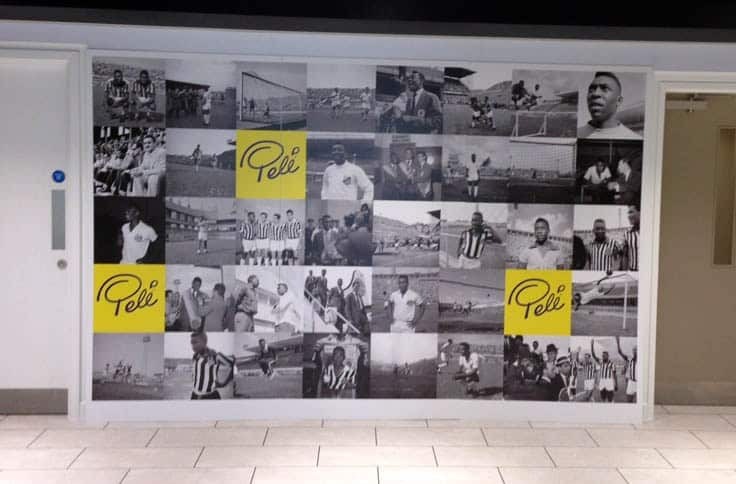 Printed retail graphics including printed floors on Alumigraphics, GFloor and self adhesive floor vinyl prints. 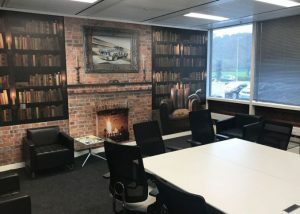 Printed windows and large format wall graphic print on phototex, wallpaper, repositionable vinyl such as Retac and our new SpotOn vinyl. 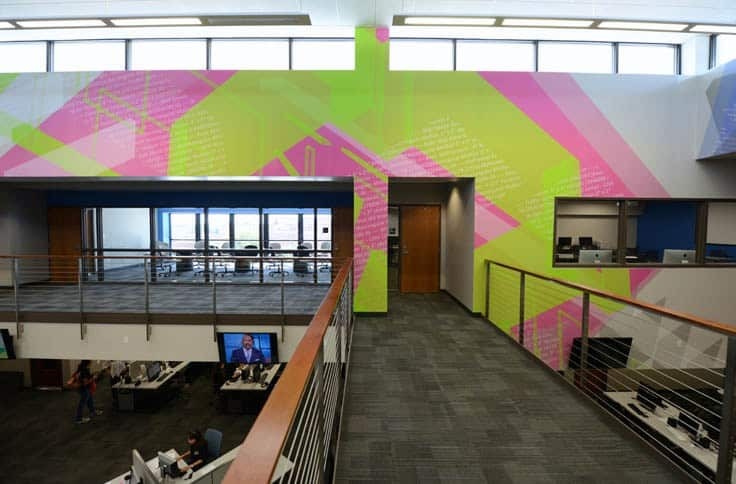 We also stock the Digimura wallpaper range for printing Digimura wall printed wall graphics. 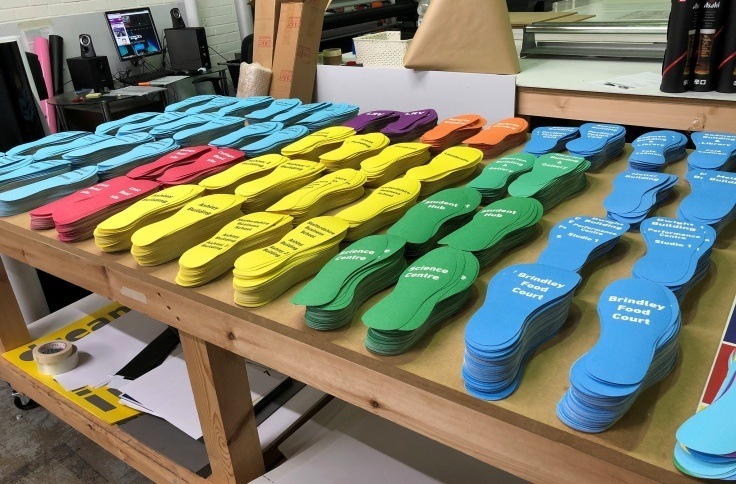 Our flat beds allow us to print direct to media on a range of popular materials including direct print to Correx, flat bed printing on to Foamex or foam PVC, flat bed digital print on Smart-X, Foamcore, foam board, Dufaylite Ultraboard and Dibond. 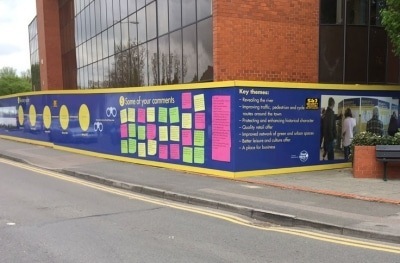 Dibond is especially popular for printed Dibond hoarding but more cost effective alternatives include printed Correx hoarding panels and printed Foamex hoarding panels. 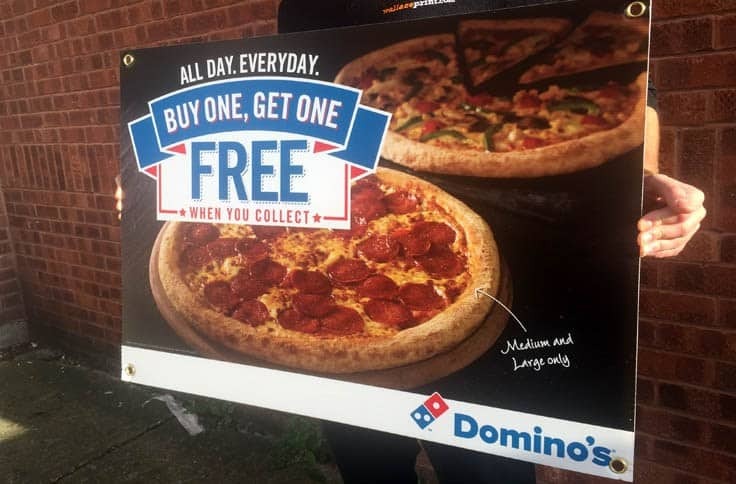 Direct to substrate flat bed digital printing also can utilise our large format digital white ink printing as well on clear materials such as white printing on to acrylic or Perspex. As well as direct to media print we also offer feather flags such as our aero feather flags and zoom feather flags, fabric exhibition display stands such as the Formulate curve, Formulate snake, Formulate slant, Impact hop fabric display and a range of exhibition hardware such as counter tables. We cover all of the UK including trade printing London, trade printing Manchester, trade printing Kent, trade printing Birmingham, trade printing Liverpool. We cover counties including Essex, Surrey, Sussex, Kent and the rest of the UK. 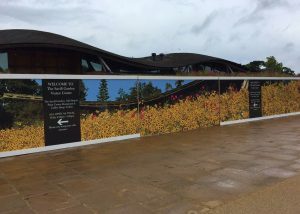 Floor graphic instals – Printed floor graphics installed internally or externally both short and long term floor graphic solutions. 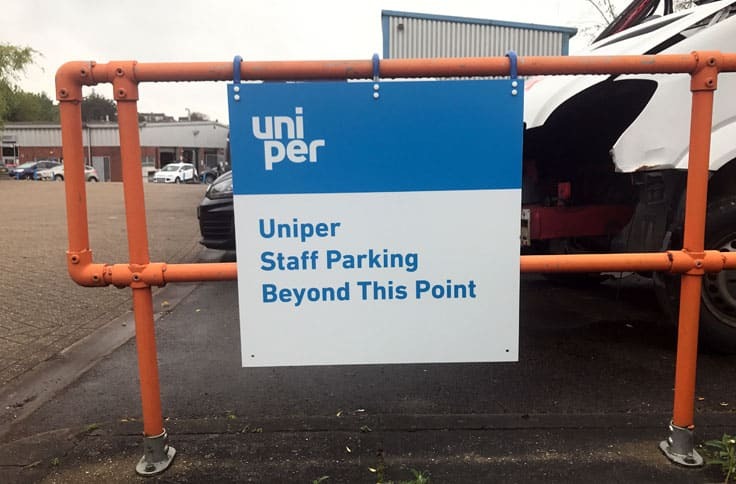 Sign Installation – Panel and post signs, external signage, internal signage, Perspex signs, Dibond signs, Foamex signs and Correx signs. 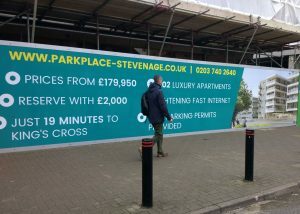 Hoarding Graphic installs – Printed hoarding graphics installed with anti-graffiti laminated printed on Dibond hoarding, Foamex or Correx. Vehicle Graphic install – Full printed vehicle wraps, printed vehicle graphics, car window installs and vinyl cut vehicle livery including fleet installs. 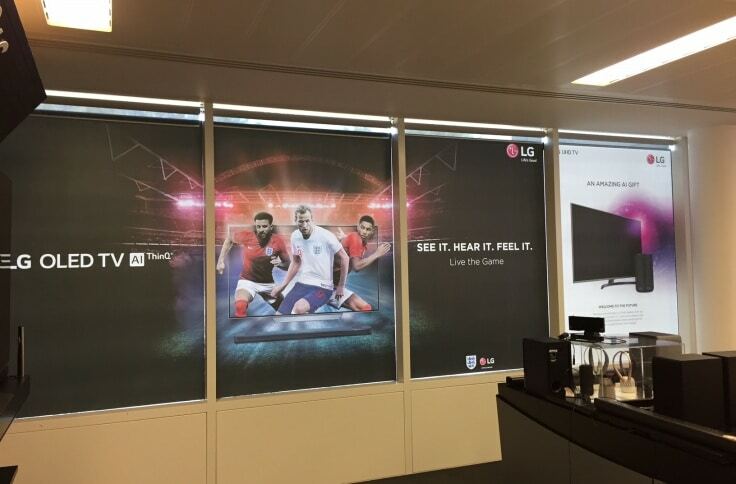 Bespoke Print installs – Retail print installs, point of sale installs, displays and printed outdoor stands. Exhibitions installs – full bespoke printed exhibition stands, exhibition display installs, printed and installed shell scheme graphics. 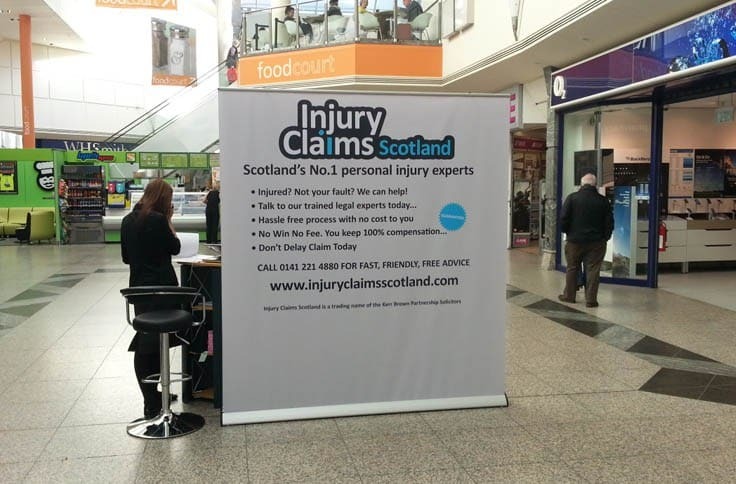 From simple roller banners and pop up displays to full exhibition stand design and build we can help. Printing a wide range of POS solutions. 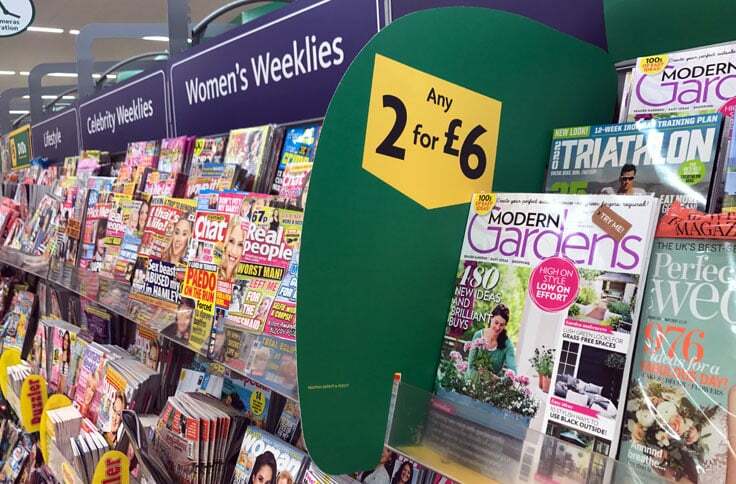 We also can manage entire point of sale campaigns, print, collate, pack and deliver to store. 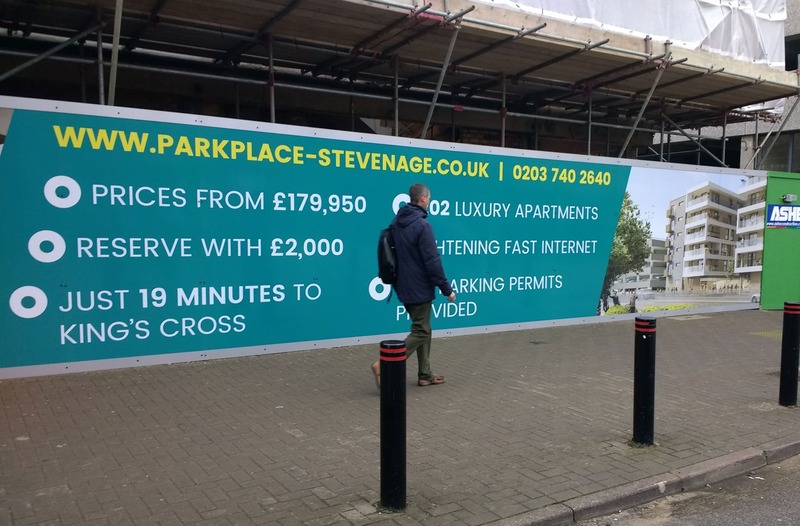 Our experienced graphic install team are experts in fitting window, wall and floor graphics, vehicles, signage and hoarding.